Nigeria: Sniper-Related Suicides - Death Prowling On the Streets? Loveth, a university admission-seeker recently took her life in Ekiugbo, Ughelli North Local Government Area of Delta State. According to a witness, she was reportedly displeased with the 163 mark she got in the Unified Tertiary Matriculation Examination. To show her disenchantment, she consumed three bottles of Sniper, an insecticide. The bottles were found by her side on the day she was found lifeless. A Niger Delta University student, Aduba Daniel also committed suicide by drinking Sniper after he discovered he had 'carryover' in his courses. This came shortly after Ayomide and Ajani Damilola of University of Lagos were reported to have killed themselves using the insecticide following the accusations that they stole clothes in their hostel. Another 32-year-old banker and mother of two, identified as Peace, of Ughelli, Delta State, committed suicide over her husband's alleged infidelity. She also took Sniper. Community sources said the deceased, who worked with one of the new generation banks along Market Road, Ughelli, did not leave a suicide note. These are just a few cases of those who have consumed the insecticide in a bid to take their lives. A few have survived. Many are not so lucky. Bottles of sniper can be picked up easily on the streets as they are sold openly in the market. In Nigeria, Sniper, which is an insecticide seems to be serving another purpose, it seems. Many cases of suicides reported in recent months are carried out through the use of the substance. Some are unreported. "The first thing that comes to people's mind when the thought of suicide comes is sniper," says a respondent. The lethargy of the authorities in observing this and the easy access many have to this substance is creating anxiety in some quarters. According to World Health Organisation (WHO), it estimated that the method used for 20 per cent of global suicides was through pesticide self-poisoning, "most of which occurred in rural agricultural areas in low- and middle-income countries". A microbiologist, Fatima Ahmed, explains the danger inherent in using the substance for a purpose for which it is not meant for. "Sniper, is a DDVP, 2,2-Dichlorovinyl dimethyl phosphate compound, marketed in Nigeria by Swiss-Nigerian Chemical Company, as a synthetic organophosphorus but which many Nigerians have converted to an indoor insecticide. "The instruction on Sniper says apply diluted portions to crops and there's a 'withdrawal' time in which the crop should not be consumed so the active ingredient degrades to minimal level before consumption. Now compare this minute concentration to drinking from the original sniper bottle," she told PREMIUM TIMES. According to her, health experts have raised concerns over the indiscriminate use of Sniper pesticide in the control of mosquitoes, cockroaches and other household insects. "They warned on its dangerous effects, especially to respiratory organs and even carcinogenic risks. A person may be exposed to the associated risk of Sniper through inhalation, absorption via the skin, ingestion, and eye contact. 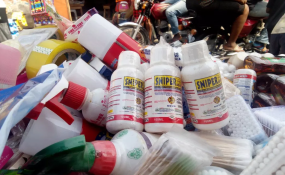 "The popularity of Sniper use amongst Nigerians as an insecticide has grown in recent times, owing to its effectiveness in killing insects better than well-established brands of insecticide," she said. The demand is also fuelled by its affordability, she adds. "A 100ml of Sniper goes for between N200 and N300 as against Baygon of N700 for 100ml or Killit of N750. "However Nigerians may be paying a heavier price with their health in the long term, if the trend is left unchecked," she added. Other experts approached for comments warn that exposure to Sniper and other insecticides made from DDVP may affect the eyes, skin, respiratory system, cardiovascular system, central nervous system and blood system. While some have survived after using Sniper in a bid to end their lives, many others did not survive, a mini-research conducted online by this reporter reveals. But come to think of it, why the option of Sniper, once the thought of committing suicide emerges? While some people think the use of Sniper is due to its accessibility, others said "it is quick and effective". PREMIUM TIMES interacted with some housewives in Suleja, Niger State who regularly use the substance in their homes for fumigation. Joy Monday said the availability of the insecticide "is the major problem". "The problem is the accessibility of sniper. It is seen almost everywhere around, once you enter the market for example Suleja here, you would find out that there are about 50 people selling it." Mrs Monday added that the insecticide is very effective when one needs to get rid of insects such as cockroaches and ants. "I do not know why it should be used for a different purpose (suicide) as to what it is meant for?" she said. Rahma Usman explained the effectiveness of the substance further. "Sniper, as a pesticide, is mainly because of the effect it has on various reptiles. When we use insecticides like Baygon, they are good for insects like cockroaches, mosquitoes and the likes, but things like lizards, wall-geckos and other reptiles including dangerous ones, cannot withstand the smell of Snipers. However, I mostly prefer to use it around my house, not inside the room," she said. Mrs Usman added that everyone knows that suicide is dangerous. "I think it's because Sniper ranks among the most available tools for the commission of suicide, that is why it is dangerous." She also gives an insight into why persons will contemplate ending it all. "Finally, if it helps, I would like to add my opinion on some reasons why people may anticipate suicide. "This includes a failure on the part of friends and associates to notice a friend slowly falling into depression. Many people exhibit tendencies of depression, but if they are not noticed, they end up killing themselves." She further said other causes include lack of parental care, failure to attain specified goals, and social ineptitude, among others. Efforts to get the Federal Ministry of Health to weigh in on this report were unsuccessful. It's spokesperson, Akinola Boade referred the reporter to a staffer called Jude to get the desired information. But Mr Jude did not pick multiple calls from the reporter or respond to messages. But in an interview with PREMIUM TIMES, the National Agency for Food and Drug Administration and Control (NAFDAC) spokesperson, Abubakar Jimoh, explained what the agency is doing to regulate dangerous substances. "We are in charge of regulation of chemicals. We have over the years put out control measures," he tells PREMIUM TIMES. "What we witnessing now is a new dimension." "In the past what NAFDAC use to battle with under late Dora Akunyili was to mount a ceaseless campaign against acid attack. If I may let you know, the fact that we are controlling chemical does not mean people would not just use it. Even water can kill, anything surrounding you can kill. "What looks very alien in the past is now common. In the past, we use to read those things on the pages of newspaper that abroad, people are committing suicide, it is not in the African culture at all. But now it is with us, people jump into lagoon, others use Sniper." He said Sniper is just one way people commit suicide. "It is one aspect, maybe if an individual quickly wants to reach out (die) instead of going to the lagoon. But that does not lie within the remit of NAFDAC. Just like talking of road safety, controlling the road movement of vehicle and every other thing and somebody decides to run across the road, how does the VIO get involved in such a situation?" He, however, said the agency "is doing its job". "NAFDAC is doing its own work. We are regulating the importation, distribution and the use of chemicals in Nigeria. What we are also concerned about is the abuse of those chemicals. The management of the agency is trying to take a look at it. "What we are witnessing now is a new dimension that is agitating everybody and at NAFDAC end, the management is also looking at how we can come in, even though it does not directly fall within the remit of NAFDAC." NAFDAC is a federal agency responsible for regulating and controlling the manufacture, importation, exportation, advertisement, distribution, sale and use of food, drugs, cosmetics, medical devices, chemicals and packaged water in Nigeria. Suicide is a complex issue involving numerous factors and should not be attributed to any one single cause, experts say. Not all people who die by taking their own lives have been diagnosed with a mental illness and not all people with a mental illness attempt to end their lives by suicide. People who have died by suicide typically had overwhelming feelings of hopelessness, despair, and helplessness, research has shown. Suicide is not about a moral weakness or a character flaw. People considering suicide feel as though their pain will never end and that suicide is the only way to stop hurting. A 2001 World Health Organisation report on the global challenge laments lack of adequate access to treatment for the mentally infirm by many developing nations. "Constant exposure to severely stressful events, dangerous living conditions, exploitation, and poor health in general all contribute to the greater vulnerability of the poor. The lack of access to affordable treatment makes the course of the illness more severe and debilitating, leading to a vicious circle of poverty and mental health disorders that is rarely broken," the report states. It, however, says nations should "de-emphasise focusing on traditional mental health institutions but focus on community care alternatives." "Such institutions (formal mental health facilities) lead to a loss of social skills, excessive restriction, human rights violations, dependency, and reduced opportunities for rehabilitation. Countries should move towards setting up community care alternatives in a planned manner, ensuring that such alternatives are in place even as institutions are being phased out," the world body said. Thoughts of suicide can hit hardest when you're in a potentially dangerous area or situation (driving, standing on a balcony, or near guns, weapons, or other potentially harmful objects. Individuals should physically move or back away from the area or situation in order to minimise the potential of acting on suicidal thoughts. Do not take unnecessary risks by having weapons or extra medications around - ask a friend or family member to keep or put them away. Slowing your breathing helps slow your heart rate and supplies more oxygen to your brain, while also shifting your attention away from whatever thoughts you're having. -Take a few deep inhales and exhales to regain control of your breath - four seconds in, hold for four, four seconds out, hold for four, repeat. There are different ways to do this and some may work better than others for you. Work toward distancing yourself (i.e., shifting attention away) from the negative thoughts of hurting yourself. A. VISUALIZATIONS: Focusing on breathing can help, especially when combined with visualisations. Imagine your lungs filling up with air, your diaphragm rising and falling. The more detail you add, the better. -If you are counting your breaths, you can also try to visualise the numbers. -For some, imagining yourself in a safe and calming space, being with someone you love, or looking to your faith can help. B. USE YOUR SENSES: Victim should close his/her eyes for a few moments and then open them. They should focus their attention on whatever is around them. "Try describing what you see in as much detail as possible - what's the texture of the ground, what colours are the walls, what sounds can you hear? Imagine you're writing a scene in a book and be as detailed as possible. "The more senses you use, the more you will be able to shift your focus away from painful thoughts." C. MUSCLE RELAXATIONS: Often, when you feel overwhelmed, your muscles tighten without realising it. (Your shoulders or jaw may flex, or you may make your hands into fists). "Focus on relaxing your muscles. Start with your head and try to relax each muscle group working your way down (face, jaw, neck, shoulders, back, arms, legs, calves, etc). You can use your hands to massage your neck or shoulders as well. "If using the techniques above don't help alleviate the intensity of your suicidal thoughts, it's time to reach out. Even if you don't think the thoughts were that serious, reaching out to others is a good habit to get into. Surround yourself with people you care about, rather than shutting down and isolating yourself. The people you care about want to help - let them know what's going on. "Call the helpline or a friend and explain to them that you're going through a particularly rough time and need their support. "Don't let worries or fears of being 'locked up' prevent you from reaching out and sharing suicidal thoughts with others. There are a variety of professional services and levels of care that can help. Like treating other illness or injuries, for some guys hospital care is a crucial and temporary step needed for recovery. "If you need more urgent support, don't hesitate to call 08062106493. Your safety is your first priority and there are professionals out there to help. "onals out there to help."